In tantalizing Thailand, try an old time classic called Som Tam. It is a salad of grated green papaya and dried shrimp that is absolutely fresh, crunchy and served spicy. A touch of palm sugar adds sweetness, while fish sauce add a sour and salty element. Another classic that can be whipped up anywhere is the delicious hot and sour Tom Tam. Lemongrass, kaffir lime leaves and galangal are essential ingredients. The soup is rumoured to even cure colds! Then you have a rice noodle dish, called Pad Thai. It is a mouth-watering stir fry with ingredients like tamarind, fish sauce, chilli and palm sugar mix, and commonly offered with shrimp. More articles on Thailand here. In vibrant Vietnam is where you will find Pho. 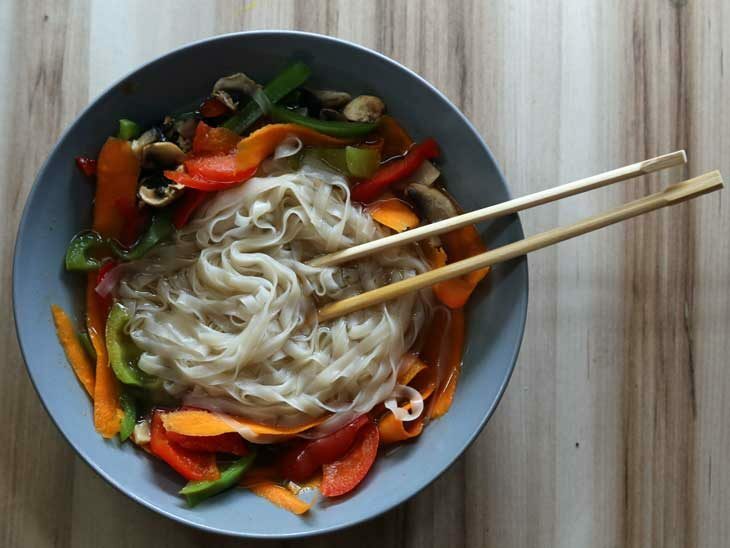 Famous far beyond the borders of southeast asian countries, this noodle dish truly captures the essence of Vietnamese cuisine; salty, spicy, sweet and sour. Contrasting yet complimentary textures from the freshest silkiest tangle of rice noodles and your choice of tender pork, beef or chicken. It delicately stews in a broth made from oxtail bones or marrow which is clear, fragrant and full of flavour. It’s topped with crunchy peanuts, crispy shallots, bean sprouts, basil and a piece of lemon. While you are there, try Com Tam which a rice dish that can be found anywhere from street stalls to fancy restaurants. The ingredients are strikingly simple – broken rice with grilled pork, pork skin, egg and fish sauce – and the taste is remarkable. More articles on Vietnam here. In lovely Laos, there is an addictive steamed dessert called Khao Tom. It is made with a mixture of sticky rice, black bean and fresh coconut cream which is then steamed in 4inch-long banana leaf parcels. It can also be made with ground rice powder, and other ingredients can be substituted in the mix, like peanuts. It’s filling, delicious and widely available. Another dish worth trying is Kaipen. It hails from Luang Prabang and it’s made with Mekong River weed that is dried, flattened, topped with vegetables, with a sprinkle of sesame seeds and then fried. It’s as thin as rice paper and as crunchy as a light crisp. It’s eaten as a snack on all occasions – from beers on the river with friends – or at weddings. In majestic Malaysia there is a beautiful mix cultures and cuisines. While you’re there head to the InterContinental Hotel in Kuala Lumpur. This is where you will find Tao restaurant. “Tao”, which means peach in Mandarin, is located on level one of the hotel. Here, you can savour the Traditional Peking Duck. A perfectly roasted succulent masterpiece matched with your choice of premium foie gras, luscious truffles or eringi mushrooms. If you want the finest treasures of the sea on your plate, then order the Braised 5 Head Abalone and Sea Cucumber with Stuffed Dried Scallops in a Wintermelon Ring. All this goodness if carefully braised in a hot steaming nutritious broth. More articles on Malaysia here. In captivating Cambodia, get some grilled roasted bananas called Som Ang. Moreish, sweet bananas are encased in sticky rice that has been cooked with coconut milk and palm sugar. The whole package is then gently roasted inside of a banana leaf on an open air grill. Then magic happens. The rice caramelise and a forms a crunchy crust while the bananas oozes and melts inside. It’s like a Southeast Asian version of crème brûlée. A cold, fresh coconut juice is a must have drink to go with it. More articles on Cambodia here. Every city in Asia has its own myriad of street food delights, from spiced potato cakes in Mumbai to fried octopus balls in Osaka. So, follow the locals to the most popular places and more often than not, you’ll find yourself savoring something scrumptious that only southeast Asian countries can offer. What is your favorite southeast Asian food? Please share in the comments below, on Twitter, Facebook , Instagram or Google+ .